How is it that I've traveled all over the world, yet had never experienced a self-drive trip up and down the stunning California coast until this weekend? All I can say is better late than never...and it's a trip I'll be doing many times again. Breaking up the drive from LA by booking stays at fab hotels in Santa Barbara, San Francisco & Sonoma County was the smartest idea I've had in a while...and I'm already planning my next visit in my head. The perfect road trip started with a leisurely afternoon drive up Pacific Coast Highway (PCH) through Malibu to Santa Barbara. It took just 90 minutes or so to reach the beautiful Four Seasons Santa Barbara, where we checked into our spacious executive suite (fave touch: heated floors & steam shower!) and headed across the street to the Coral Casino Club (part of the $300 million recent renovation). Reserved for members and hotel guests only, the Club features the largest hotel pool in the US and an oceanview bar/restaurant (ideal for enjoying a pre-dinner snack of Skinny Margaritas and truffle-infused popcorn!) From here, we headed out to La Super Rica, the local taco stand made famous by fan Julia Child. The long lines are worth it as the authentic Mexican food is homemade, the beer is cold and the experience unique to Santa Barbara. Day 2 of the "perfect road trip" consisted of a 5.5 hour drive up the 101 North straight into San Francisco. It's a scenic drive (especially if you've not seen this region before) as you pass through small, vineyard-lined roadways and towns including Paso Robles, San Luis Obispo & on up through Palo Alto. In a city filled with great hotels, the Four Seasons San Francisco stands out as an oasis from the constant buzz. Located on Market Street just steps from Union Square, the hotel's sophisticated decor (neutral tones, eye-catching artwork) and the five-star service are a welcome antidote to the hilly walks through must-see tourist-filled spots like Fisherman's Wharf and Ghiradelli Square. Stroll down Geary Street in the evening for drinks and dinner at Clift Hotel, designed by Phillip Starke. Cocktails in the hotel's original Redwood Room (a former Prohibition-era hang out) followed by an amazing dinner at the brand new Velvet Room (occupying Asia de Cuba's former home) was the perfect way to spend our one evening in San Francisco. If one's prefence leans towards chic boutique style over sophisticated zen-like decor, Clift is the perfect spot to stay in SFO. Next stop on the agenda was the one I'd most been looking forward to: 2 full days in Wine Country, specifically, Sonoma County. The scenic drive over the Golden Gate Bridge to The Farmhouse Inn in Forrestville took just over an hour and gave us a taste of what was to come. Vineyard after vineyard lines River Road leading to the 18-room, recently restored Farmhouse Inn, owned by brother and sister Catherine and Joe Bartolomei. The brand new Barnhouse Suites (housed in an authentic barn that's been totally transformed) give new meaning to "barnhouse chic". Spaciously laid out with a separate living/bed room, the suites feature textured wood walls, high ceilings, comfy sofas and chairs, heated marble bath floors (perfect after a steam shower or soak in the jetted tub). I also adored the plushly appointed four-poster king bed, our own very private patio, and the indoor/outdoor fireplace. The staff (notably Anna and Tamera on the concierge team) went above and beyond to ensure we had an incredible stay--from booking a table for us at Healdsburg hot spot Spoda to pre-booking our couples' massage at the Inn's own lovely spa. Unique and fun touches offered at the Inn include complimentary self-serve snacks , sodas, waters & even fixings for s'mores(ideal for winery outings & evenings in the suites. Boxed gourmet picnic lunches can be arranged for guests, as can priority reservations at Farmouse Restaurant, the dinner-only (Thurs-Sunday) on-site Michelin starred restaurant where I had one of the best meals of my life (soft shell crab with summer corn succotash followed by seared line-caught halibut and topped off with a Valrohna souffle & caramel toffee gelato). Of course, what's a few days in Sonoma Wine Country without visits to area wineries? The Farmhouse Inn has preferred relationships with nearly a dozen of the area's best winemakers--this translates to VIP treatment and in some cases, comped tastings & additional pours upon mention of who referred us. A few of our favorites included J Vineyards, Copain & Lynmar Estate. The latter is the perfect spot to stop for lunch--we loved our freshly prepared gourmet picnic ($35/person including two tastings) overlooking the estate's gorgeous gardens surrounding the family-run vineyard. While sad to leave the cushy confines of Farmhouse Inn (I could have used another day to simply laze by the pool! ), it was indeed a special treat to drive home along breathtaking Highway 1, stopping for lunch seaside at Schooner's in scenic Monterey, and continuing south through Carmel (pictured), Big Sur, and on down through San Luis Obispo, Santa Barbara before ultimately ending up back where we started, at home in LA. I feel like there is still so much to see--like the famous fried artichoke stands in Castroville, the Hitching Post restaurant featured in "Sideways" near Solvang, the cute shops of Healdsburg, and of course, many more boutique wineries. Next time, I'll insist we also make time to enjoy a night or two in Carmel--it's too pretty a place to simply pass through. For more information on the perfect California coastal trip, contact us at elitetravelgal@gmail.com or phone 310.979.9036. Also, feel free to friend me on Facebook (www.facebook.com/stacysmall) to see photos from my trip and followe me on twitter (www.twitter.com/elitetravelgal) for live tweets from upcoming adventures. My husband and I took our own California sports car road trip in May. Like you, we stayed in the Barnhouse Suites at Farmhouse Inn. What a luxurious, relaxing experience. I had to pry myself away from our suite to go wine touring. The experience was that good. I enjoyed reading about your stay, as well. I really like the picture of the coast! If I ever visit Santa Barbara I want to check this place out. Driving up the California coast is an unforgettable experience. It's amazing with so many people here, that one can experience so much openness, beauty and serenity. Simply breathtaking views are around every bend of the drive. 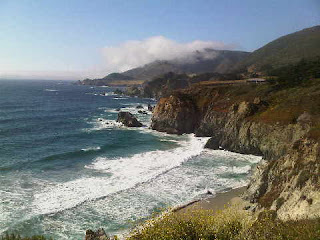 I love Santa Barbara and Big Sur!